No…this sermon is not about the “actor” or any of his movies. It is about the One who is The Rock. Do you remember ever reading or hearing this from many moons ago? All the armies that ever marched, all the navies that ever sailed, all the parliaments that ever sat, all the kings that ever reigned, put together, have not affected the life of man on earth as much as that One Solitary Life. That is just part of the poem/story told about Jesus. 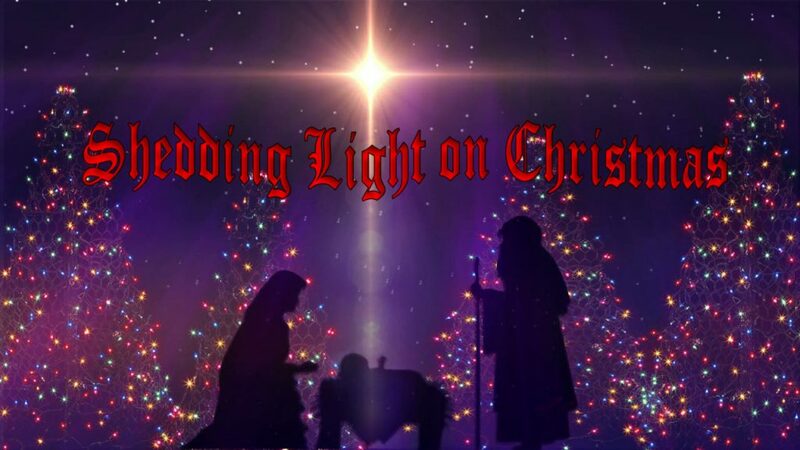 It is amazing how much Jesus is mentioned in our culture, but not necessarily out of respect. He’s in the world of fashion. (Who could forget the infamous “Jesus is my Homeboy” t-shirts many celebrities wore?) He shows up in movies. He shows up in music, both good and bad. He shows up at award shows (again both good and bad). He shows up in the world of sports. He shows up in the religions of the world (Don’t get me started on that!). Who Jesus is, according to the Bible, is a non-negotiable. That is where I choose to Stake My Claim this Sunday. If you live around here, please join us. If not, you can listen via podcast. In any case, please pray for me and for the folks this coming Sunday. Thanks. I’ve been somewhat absent here this week. Life has a way of doing that you know? Tuesday afternoon I made an hour trip to Greenwood to visit someone in the hospital. Cancer is an ugly disease and what he has is especially vicious. Please pray for Billy & Becky as they pray for God’s healing or His will. He has fought for two years with an incredible will to live. This is where I wish I was Jesus…I could speak the word and he would be instantly healed. But I’m not. I just believe in the power of prayer, but also the reality of God’s sovereign will. Today is my daughter Janna’s birthday. I will not tell her age but simply say she is less than 40. Just less than. 🙂 God blessed me and Jo with two beautiful girls-Tami & Janna. I am proud of both of them. But this is Janna’s birthday and a tribute to her. I am so thankful God blessed us with her. She and Tami were so-o-o-o different. Where Tami would sit for long periods of time with me and let me read to her (and eventually turning that around), Janna would have nothing to do with that. Her learning curve was different. “You won’t teach me how to put those little shape things in that box. I’ll do it myself at my own speed.” “I’ll learn to read when I’m good and ready to read.” (She did). I am thankful God gave her to us. I am thankful for the woman, wife, and mother she has become. (Both those latter ones she was not interested in for awhile). I am thankful she still loves her dad (and mom), even though we are getting old. And I’m thankful she loves Jesus. I don’t have a song from 1979 that I liked. It was the disco era and…well you know… But I did find the song we danced to at her wedding. She was a Stryper fan as was I so this is the song she chose. Yeah, I know…the hair. 🙂 🙂 🙂 Happy Birthday Janna! Today I get to meet a camera crew. 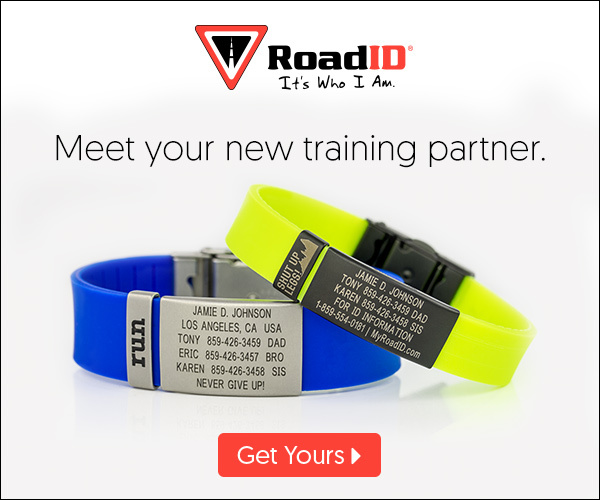 The folks from RoadID are coming to film me for a promotion video. For those who may not know: I was hit while riding my bike by a hit-n-run driver on November 7, 2016. I was pretty much recovered from that when I had a more devastating wreck while going downhill on February 17, 2017. I broke my collarbone, 3 ribs, did a face plant, split my helmet in 3 places and had other abrasions. When the squad came I pointed to my RoadID for them to get contact and medical information. Click on the sidebar to find out more information. I’ll let you know how it goes. Thanks for listening to my ramblings. Hope you have a great day. Is that not cool or what? That sort of lays to rest the cutesy plaque. That also puts to rest that coming to Jesus is a one-time deal. It is more than saying a prayer; signing on the dotted line; being baptized; making a public confession or any other form of admission to following Jesus. The life of following Jesus is one of surrender. My video today is here. The lyrics are pretty clear as you listen. May it be your anthem for this week. I was just listening to a song by Styx called “Snowblind,” about the dangers of cocaine. One of the refrains says, “Mirror, mirror on the wall/The face you show me scares me so…” That describes my morning look into the mirror! Reality has set in for me. Well, it has for quite awhile but there are some things I cannot deny. Long hair to no hair. Dark beard/goatee to gray. Joints which creak. 🙂 Joints that don’t want to work anymore, or at least very crankily. There is other visible evidence which I cannot deny. The mirror just does not lie. While reading Caleb’s new book (I talk about it here) I ran across a great story! It comes from the movie Creed, where Rocky is training Adonis, Apollo Creed’s son. (Watch the first 100 Rocky’s to know who he is. Actually the first 4). Who knew? Rocky the boxing philosopher! I agree with him actually. I have tough times, seemingly on a daily basis (although that would be an exaggeration), but no battle I face is bigger than the one I have with the dude looking back at me in the mirror. It is not a physical battle (although it is looking like 65), but an inside job. Who am I? Do I have what it takes to serve Jesus? Am I His or just playing a game? Am I ready for today’s battle? 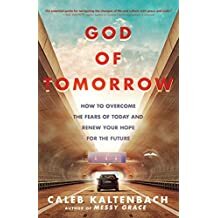 Over the past week or so I have been reading God of Tomorrow, Caleb Kaltenbach’s new book. A normal review will give the pros and cons , good points and bad points, and whether it is worth your while to read it. I’m going to take a different approach in this post. I want to highlight several of his included quotes and thoughts. Then let you decide at the end if it is a book you want to invest your time in. “Combativeness without compassion is always going to be counterproductive.” We need to have our beliefs but we don’t have to cram them down someone’s throat nor do we need to be militant. “Our differences with people should drive us to them, not from them.” This is sure opposite of our “hunker down” attitude. “Our fear is no match for the unlimited power and uncontested reign of God.“ When will we learn this? Instead of fearing change, let’s hold to our beliefs but not shy away in fear. “Hope reminds us that our best days are ahead, not behind us.” And I might add not right now either. No apologies to Joel for that. “Out-of-place people always have a place with God.” I seem to remember someone telling a story about going to the highways and bi-ways to bring people into a meal. Hmmmm. Maybe this would change our approach toward “unlovely” and “unacceptable, despicable” people we often have. What do you think of those quotes? Think you might get this book? 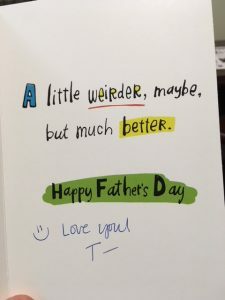 I received a FD card from my oldest daughter, Tami. She thought it was funny. I told her not to quit her day job. Actually, none of that is true. It is true I got the card from her. It is true she thought it fit and was funny. What is not true is the conversation. I laughed. I did tell her via text: “I’m honored you think I’m a bit weird. You wouldn’t want all normal people. How boring is that?” Being a father to Tami and Janna and a grandfather to Braden is one of the highlights of my life. $89,420 average cost for four years of college now. $372,397 average projected cost in 2033, when your 3-year old today heads off to college. That’ll scare the heeby-jeebies out of ya’! Tony Hawk, arguably the world’s greatest skateboarder. Coolest dad ever? His kids on him turning 50. 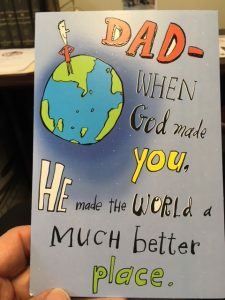 Hope you had a good Sunday-father or not.